Over the past 6 weeks, USD/JPY has had a tremendous run. On Feb 1, it was trading at 76 and today, it rose above 83.50. This 7.5 yen move impressed everyone, particularly given the lack of meaningful correction. But the burning question in everyone’s minds is how much further can USD/JPY rise. A few weeks ago, I pointed to the break of the weekly cloud cover as the main technical reason for my pro USD/JPY call. Since then, the pair has rise a mere 250 pips. This is peanuts compared to how much USD/JPY has run on past cloud breaks. 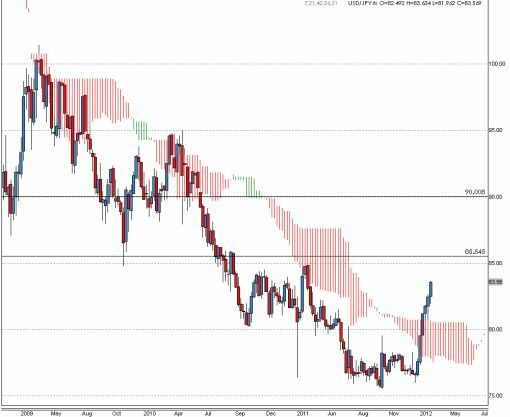 From the top of the cloud to the top of the initial rally (not counting the pullback and continuation), USD/JPY rose 29 Yen (97 to 126) in 1995, 18 Yen in 2000 (108.5 to 126.85) and 12 Yen in 2005 (108.5 to 121). 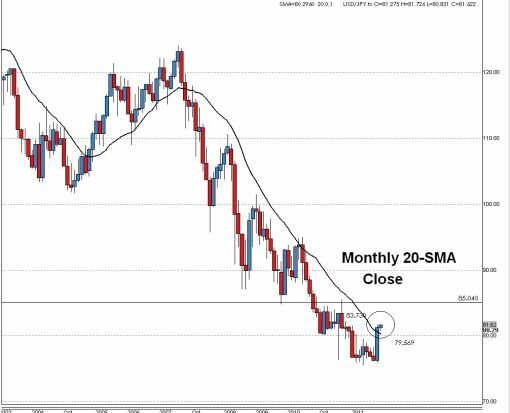 From a levels perspective, there will be resistance at the 2011 high of 85.50. In fact, we could even see a bit of consolidation around that level. But even if we low ball the potential move based on how weekly cloud breaks have performed in the past and then downgrade it some more, USD/JPY could easily reach 90. The best part is that there is fundamental support for the rally. Unlike the Federal Reserve who has frozen monetary policy, Japan is on a rampage to keep the Yen weak through easy monetary policy. The massive current account deficit reported last week also changes the inherent dynamics in the Yen. Although this is expected to be temporary, for the time being Japan is no longer a surplus country. At the same time, rising U.S. yields is sending the dollar sharply higher. The only potential cause for a pullback in USD/JPY would be repatriation ahead of the March 31st fiscal year end. 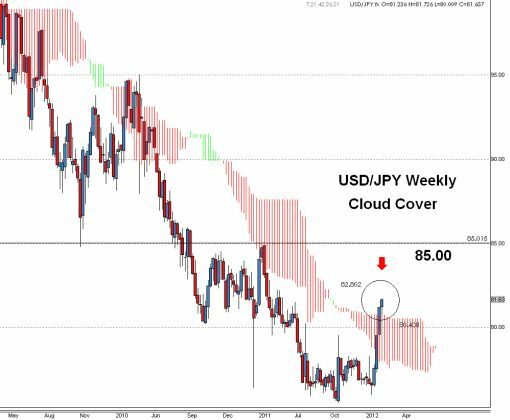 Last week, I was all over the weekly cloud cover break in USD/JPY (see chart one), talking about how important it is and why further gains are likely. It is a new month now and we have another important technical break on the monthly chart (see chart 2). USD/JPY closed above its 20-month SMA. This confirms the degree of bullish sentiment in the market right now and reinforces my view that USD/JPY is headed higher for 85. Over the past 18 years, USD/JPY has CLOSED above its weekly cloud only 4 times (not counting this one) and in 3 out of those 4 instances, a very sharp rally in USD/JPY followed. USD/JPY has been on a tear since the beginning of the month in large part due to rising U.S. yields. Based on the following chart, the slope of the recent rally in USD/JPY is much steeper than the slope of the 2 year U.S. Treasury yield which suggests that either the run in USD/JPY is overdone or U.S. yields need to rise further – you decide. I can’t take credit for this chart – my buddy at Nomura sent over this chart of USD/JPY in relation to US yields. 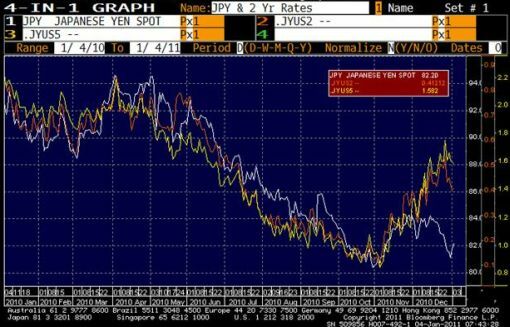 The white line is the USD/JPY spot rate, the yellow line is the 5 year US-JPN yield spread and the orange line is the 2 year US-JPN yield spread. As you can see, there is a strong relationship between these instruments and the lines do not usually diverge significantly. 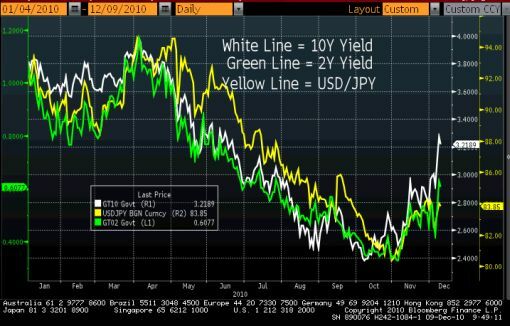 However that changed in December, when USD/JPY fell steeply DESPITE a rise in the yield spread. 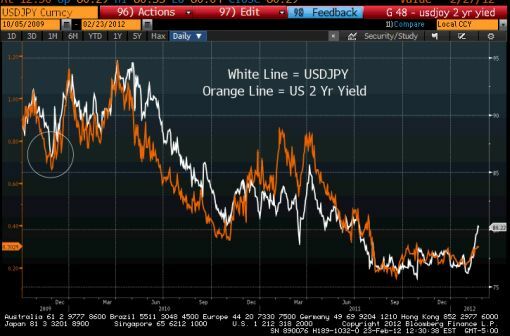 What this chart suggests that USD/JPY ought to be trading at 86 and not 82.